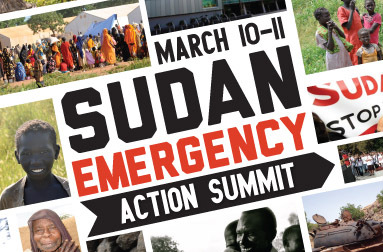 Please join Act for Sudan and hundreds of leading activists from around the country on March 10-11, 2013, for a unique educational and advocacy event focused on the ongoing crises in Sudan at George Mason University, in Washington D.C. The summit includes an optional afternoon of lobbying on Capitol Hill. This conference will draw together U.S. and international officials, humanitarians, Sudanese leaders from Sudan and in the U.S. diaspora, as well as genocide scholars, activists, and members of the media will meet and confer in one place. The summit provides opportunities to learn firsthand from those with direct experience, to gain and create new ideas for activism and advocacy, and to network. Summit highlights include notable speakers, such as Luis Moreno-Ocampo, former chief prosecutor for the International Criminal Court, and Mukesh Kapila, former U.N. humanitarian coordinator for the Sudan. In addition, Rich Williamson, former U.S. special envoy to Sudan, will join John Prendergast on a panel called Policy and Action – Changing USG Policy. Please visit www.actforsudan.org/summit for further information on summit programs and activities, including additional speakers, panels, and a variety of workshops. Early Bird Registration donation of $60 ends February 15, 2013. Special hotel pricing of $99/night has been arranged. Once you have submitted your registration and payment you will receive information on booking the special hotel rate. Travel to D.C. can be cost prohibitive, and AFS hopes to reach as wide and as inclusive an audience with this summit as possible. To that end, a limited amount of fee waivers or other travel assistance is available. The conference promises to be a pivotal event for the Sudan advocacy movement. We hope to see you there.